There are no free resources in the world, and time isn’t excluded in this fact. Time seems to be running out for young people across the world to act and it’s proving to be costly. Using basic mathematics, whenever the time factor changes, other parameters change as well. For example, it is estimated that by 2050 the eutrophication of Oceans will increase by 21%. Today’s youth will bear witness to not only the eutrophication increase, but the resulting extinction of species unable to adapt to this changing climate. This is a concept well understood by the Kenyan Youth Biodiversity Network – a group of young people who have decided to utilize all available tools to reach tangible change while the time ticks down. Having started in 2017 with just two members who were strongly committed to bringing fellow young people together to conserve Kenya’s fast-dwindling environmental resources, the Kenyan chapter of the Global Youth Biodiversity Network (GYBN) has achieved beyond expectations. Since its inception, the network has reached out to over 6,000 young people, utilizing the power of community activism to pass their messages along. The chapter’s activities are geared towards creating awareness through education, knowledge formulation through research, and leadership skills building. A youth-led community clean up exercise. The Kenyan Youth Biodiversity Network has risen up to be one of the top performing environmental youth platforms in the country that is working on viable nature-based solutions to current threats to the environment. By working closely with stakeholders, the group is changing the attitudes and perceptions of the community, businesses, government, and fellow young people to realize the urgent need for working mechanisms that will sustainably conserve our natural resources. Using a well-structured framework of action, these young people have formed a national team of grassroots coordinators who educate, train, and enhance the participation of local communities in safeguarding the future of the environment where they live, starting with the prevention of the possible loss of biodiversity. These dedicated nature champions are changing the conservation narrative one step at a time. While attending the event, I was interested in finding out what led to the formation of such a network. So after the event, I pulled her aside to understand more about this incredible group. “The need to come up with a national platform where young people could harmonize their work, efforts, and voices in relation to biodiversity conservation is what greatly pushed us to form the Kenyan youth biodiversity network,” said Maryanne, the Chapter’s Co-Founder. Maryanne went on to imply that nature brings together all human beings, and that is why there is a growing demand for a model that will ensure unified efforts, youth innovation, and government goodwill to achieve the common good. “As a youth platform, we are constantly seeking answers to modern climate change questions and wondering how young people can play a central role in it. We are going as far as asking religious leaders to influence their congregation to adopt sustainable means of living such as smart agriculture, water and waste management, and plastic pollution,” added Maryanne. The youth group is integrating aspects such as gender, human rights, economics, construction, and finance into their quest for a more practical post-2020 global biodiversity framework that will take effect in 2021. The new working policy and action plan will be spearheaded by the United Nations Convention for Biological Diversity (UN CBD) to which the GYBN is aligned. This comes after the expiry of the current global decade of biodiversity that has been in effect since 2011 and comes to an end in 2020. True to their vision, the young people in this network have that a lot can be achieved by integrated efforts, boldness, and harnessing the power of collective efforts to address the common threats to Kenya’s biodiversity. The group has, for instance, spiked a cross-sectional dialogue between young people and their local and national administration in a bid to provide sustainable solutions to the challenges of conservation and ensure the voice of young people is heard and addressed. In November 2018, the chapter converged young people from 17 African countries in Nairobi, Kenya for a capacity-building workshop on youth-led biodiversity conservation. Amongst the invited guests were various government officials including the Permanent Secretary of the Ministry of Environment and Wildlife. Influential speakers such as the President of the African Wildlife Foundation and other organization and private sector leaders were also present to take part in the dialogue that resulted in a bold action framework that will see the transformation of conservation in Africa. Most of the insights from such discussions are summarized by the youth chapter and included in regional and international consultations and policy meetings, including the Conference of Parties. The theme of “leaving no effort untouched” has seen the Kenyan youth biodiversity network go extra miles in deriving community youth integration tools that are more reliable and easily identified by the growing generation. A good example is the group’s perfect exploitation of digital platforms to ensure young people from across the country are actively involved and updated on the events, activities, reports, and planned work. Its WhatsApp group has more than 225 members, almost reaching the maximum the platform can hold, along with Facebook, Twitter, blogs, and hashtags to engage youth across all platforms. They have organized two online youth challenges in which the winners were gifted merchandise and online celebration as Heroes of the Earth. The youth group has organized several awareness forums for young people aimed at documenting the input of youth in conserving their immediate natural resources. In June 2018, a walk was held in Busia County, and similar events and activities have been held in Nyandarua, Nairobi, and Nandi Counties across Kenya. In April 2019, the conservation group will take part in the Global March for Elephant, Rhinos, and Lions. The Kenyan chapter is also organizing the first-ever awareness and advocacy caravan on Ocean Conservation to be held in Kenya, where 200 young people will travel by road from Nairobi to Mombasa, covering a distance of 500KM with several stopovers to engage other young people, policymakers, and the general communities on the need to ensure the sustainability of Kenya’s marine resources. Through such efforts, the group is constantly able to hold leaders accountable for conservation pledges they make to young people in relation to conservation. 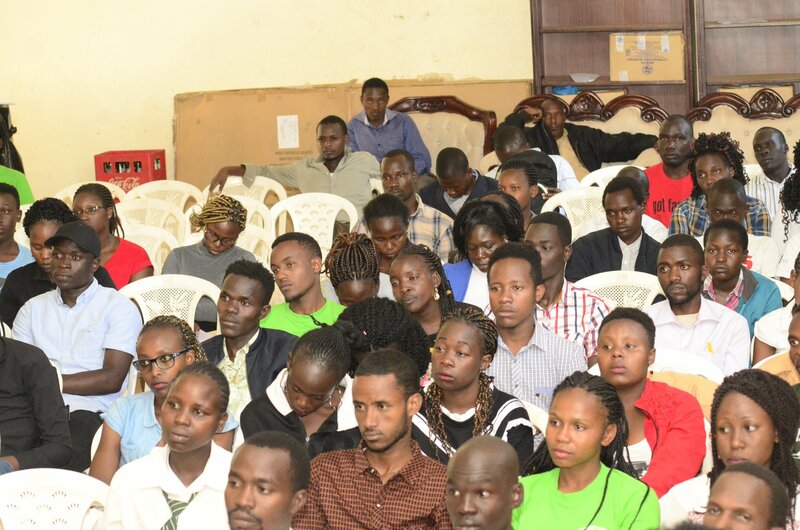 A youth-engagement summit in Nandi County, Kenya. Through these campaigns, more young people in Kenya are aware that they cannot afford to miss an opportunity to stop landscape degradation, climate change, and other conservation concerns because this may be the last generation with an opportunity to do so. Volunteers in the program have realized their ability to generate real change, seeing that community activism works! Youth are more confident in using their voices to express themselves and their concerns to decision-makers and stakeholders. Also, young conservationists have discovered that cooperation is key in attaining sustainable climate change mitigation. The County Government of Nandi, for example, has committed and employed more young people in their environmental docket who are now actively designing viable modules for the area’s resource conservation. The Kenyan youth biodiversity network has even garnered support from the African Wildlife Foundation, helping the group to gain credibility and visibility in their efforts. Emmanuel, the programme’s Coordinator, acknowledges a number of bottlenecks that have hindered the group from achieving some of its targets. Designing a universal system that addresses main threats in the biodiversity conservation space is a task that the chapter is looking at. “We are always challenged to constantly and collectively look at systems that address underlying causes of biodiversity loss such as over-extraction, pollution, agriculture, and over-population. To attain this, we must consider ways in which all the development can be done within the walls of conservation,” says Emmanuel. Inadequate financing, lack of enough legal policy and political goodwill, and a deliberate lack of youth inclusion in planning frameworks are additionally some of the hurdles the group face. However, the chapter is positive about working within and outside their capacities to ensure effective youth-led solutions to biodiversity loss. Invest in youth like Kevin who have a vision for a better planet.